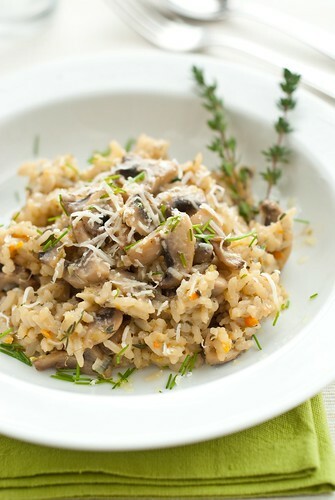 I have wanted to make my favourite mushroom and thyme risotto for a long time! I so much like it...! I had planned it several times, but in the meantime I tried new and interesting recipes, and no space left for the risotto. Other things happened, which kept me from making it. Such as when we went to Prague to celebrate our birthday and my thyme, I had been growing for couple months, dried completely because nobody watered it for a week. Poor thyme! Finally, I made space for the risotto last friday evening. I gave it all the more care, and I can say it was the best risotto I've made, so far. If you don't like mushroom or have another vegetable left, use it. I also like it with spinach or broccoli. 1 Prepare or heat the stock in a saucepan and keep it aside. 2 Heat the olive oil in a big nonstick pan and add the onion, celery, carrot and garlic. Fry the vegetable slowly for about 10 minutes until softened and slightly coloured. Turn the heat up and add the rice, then stir well. The rice will become translucent. Pour in the chosen alcohol, keep stirring until the liquid has cooked into the rice. 3 Now add the first ladle of hot stock. Turn the heat down and simmer, stirring often. Allow each ladle to be absorbed before adding the next. Add the thyme and rosemary. Carry on adding stock until the rice is soft but with a slight bite left in it. This should take about 30 minutes. 4 Meanwhile, heat two spoons of olive oil in a pan. Add the spring onion a fry slowly for 1 minute. Stir in the mushrooms and fry until the mushrooms are soft. Season well. 5 Take the risotto off the heat. Stir in the parmesan and the mushroom, check the seasoning. Put a lid on a pan and leave the risotto to relax for about 5 minutes. This is the time when the risotto become beautifully creamy. 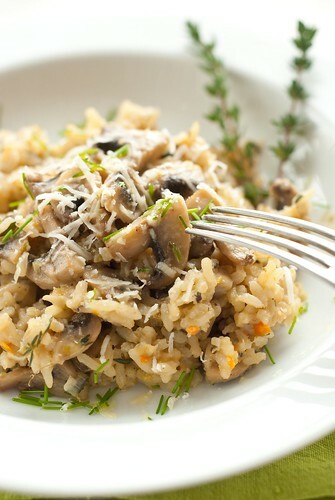 6 Serve the risotto topped with the parmesan shavings and fresh parsley or chives. Finish with a drizzle of extra virgin olive oil.